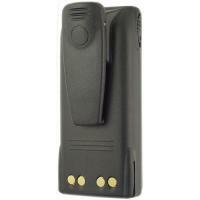 Get the most out of your user experience with a replacement battery for Motorola HNN9009AR. Covered by a 1-year warranty and boasting a 2000 mAh capacity, this 7.5V backup battery is the ultimate alternative for any Motorola owner. Whether you need it for your everyday usage, as a spare, or a total replacement, the CodeRed replacement is a great choice for all technology enthusiasts. It works with the following radio models: Motorola: HT750, HT1250, HT1550, PRO5150, PRO7150, PRO9150, and more. Japanese cells.